Michigan Gov. Rick Snyder designated that state’s portion of Lake Erie as impaired Thursday. The action prompted calls by activists for Ohio officials to do the same. Lake Erie has been threatened by toxic algae blooms for several years, threatening drinking water quality in Toledo and limiting recreational uses such as sports fishing. 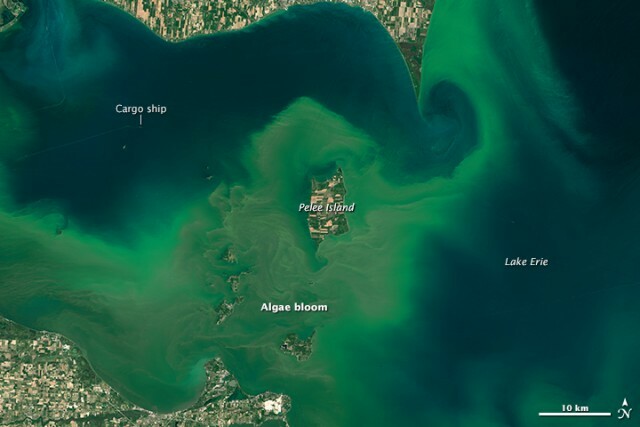 Within the past year, the governors of Michigan and Ohio and the premier of Ontario signed a memorandum of understanding acknowledging the threat of toxic algae. They set a goal to reduce phosphorous loading up to 40 percent by 2025, according to Jill Ryan, executive director of Freshwater Future. Phosphorous loading refers to runoff from agriculture and cities and from sewage systems that contaminate the water. The nutrients from this runoff feeds algae and allows it to bloom more rapidly. By designating Lake Erie as impaired, federal funding and expertise can be used to combat this problem. The action met with approval by several conservation and environmental groups in the Great Lakes region. Dan Eichinger, executive director of Michigan United Conservation Clubs, agreed. “This sets the stage for strong regional action that benefits people, communities and businesses, including the millions of men and women who fish, hunt and recreate in and around Lake Erie and surrounding habitat,” he said. The group minced no words in a press release calling for Ohio leadership to take similar action. Ohio has only brought attention to its shorelines and not the rest of the lake, Rissien said. By not labeling the rest of the lake as impaired, Ohio limits the resources it can use to deal with the algae bloom, he said. Finally, good to see Michigan take this action. A formal finding of fact and policy of “impairment” triggers not only duties to act by Ohio and Michigan officials, but imposes duties on other interests to take actions that end or diminish this impairment. The Michigan Const. Art 4, Sec. 52 demands our legislature enact laws that protect against impairment of our waters and natural resources. The Michigan Environmental Protection Act, Par 17, NREPA, does the same, and grants courts jurisdiction and authority to conduct hearings and impose injunctions and equitable remedial orders on those contributing to this impairment. As a broad backdrop principle, as noted by the IJC this year, the public trust doctrine applies to all states on Lake Erie and other Great Lakes and prohibits material impairment of its waters and public uses such as swimming, navigation, boating, fishing, and drinking water. This common law doctrine also grants courts in both Ohio and Michigan to take action if governments fail to act.